So I’m going back to those grassroots for a while. Jordoba isn’t a polished, finished project being handed down by a publisher as a complete product. Instead, it’s the material spun out from the ongoing process of building a campaign world organically, through actual gaming. The world is developing simultaneously in the 5th edition rule system and in the original 1974-1978 version of the game (Swords & Wizardry). They’re not incompatible except in the eyes of dedicated edition warriors. 0e Monsters of Jordoba is an eight-page supplement for the developing world/setting/cinematic universe (kind of). It, as the name implies, focuses on the various monsters and monstrous entities that populate the Jordoba setting (or at least those that have been encountered so far). Each monster takes up between 1 to 2 pages of the total 8, with a photograph of a mini being used to represent the creature. I find the mini shoot to be fun as it really brings home the mission statement put forth by Finch in the opening segment. Altogether there are 5 monsters presented, in the standard Swords & Wizardry long format, with some details on history, abilities, how the creature fits into the world, etc. All in all, for a doller it is very much worth the price. From a quick look at the OGL in the back, all the monsters are included which is great as I have always found Matt’s creations to be a hell of a lot of fun. 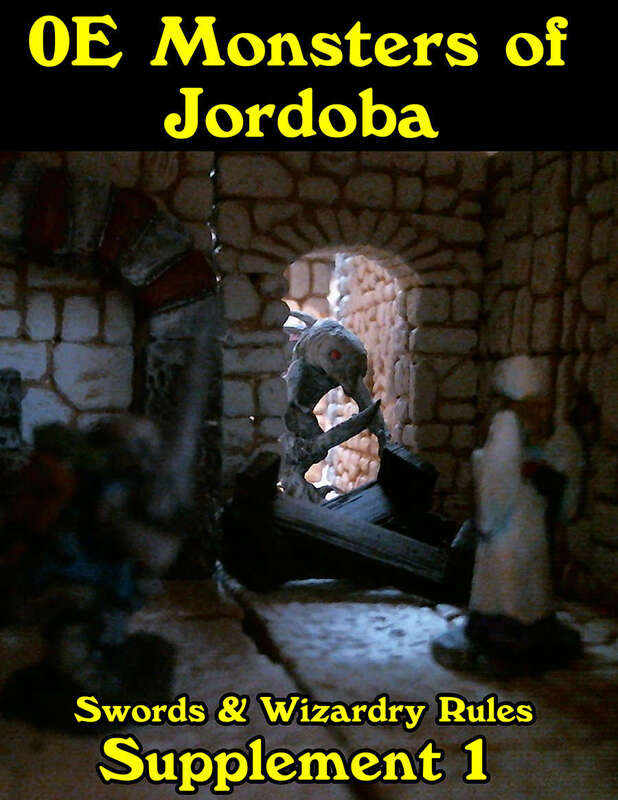 0e Monsters of Jordoba (aff) is available as a PDF from Drivethrurpg for $1.00. I absolutely love this series! It's been getting me thru my work day. (It's nice that I can play that in the background while I work). I hope that Matt puts up a bit of a preview, so that I can take a look at some of the monsters. But as you say, he seems to put out some awesome stuff, so it's probably a no brainer.